Deliver a powerful Content Management System capable of supporting a global brand. Provide advanced features such as the ability to update designs without rebuilding the site. Our content management system was the perfect solution to power a global brand website. 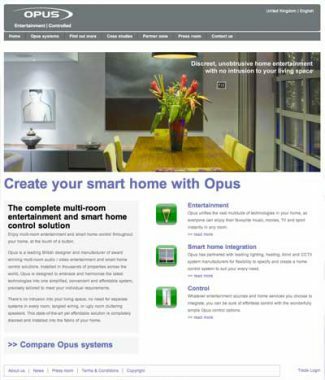 With built in multi-lingual capabilities and multi-territory content switching it delivered everything Opus were asking for. They needed a system which was designed to allow the look and feel of the site to be updated and even completely changed at the flick of a switch. With our many years of experience at building advanced content management systems we have the perfect solution for such requirements. Our system has complete separation of design / layout and content / data - using advanced template technology the client is able to incorporate complete site redesigns without the hassle of a new content management system to incorporate these creative changes. This means that the investment you make now will pay itself back for years to come - indeed many of our clients using our content management systems have been running them for over 6 years - what better testament to the power, stability, flexibility and adaptability of our skills than the fact that they can successfully deliver global web sites for years and years. We worked closely with the creative team to design and build web page template designs, assuring they complied with the latest Search engine optimisation, accessibility and coding standards. The majority of the development work on this project was the creative side as the CMS system comes pre-built with so many advanced features. We also added a few bespoke modules to ensure the system fitted exactly to the clients working requirements. Turnaround was very quick as the system is ready to populate with content after just a few hours of setup. This was important as it allowed the client a long lead time for transitioning to the new site and getting comfortable with the system. We provided a test system at the start of the project and worked with the client every step of the way to ensure they were getting the most out of the advanced technology we were delivering to them.